This web-user gave a score of 3 / 5 to Vacances Bleues on november 2017, but declined to leave a comment. We stayed in a room on the city side and the noise in the street started at 5 a.m. making it completely impossible to sleep. Trucks were transporting goods to the stores across the street and collecting garbage. I took my matress the bathroom and tried to go back to sleep there . We went to another hotel for the second night. Would not recommend to stay in this hotel. management had turned off the A/C although it was exceptionally warm for the season. Facing south, room temperature was well above 25 degrees.The receptionist understood our discomfort but management replied “it was for the benefit of the clients” - we suggested they should monitor our room temp but this was ignored. Will not stay there again. We recommend Ibis Styles - they have a good A/C and a much better Service attitude. The hotel was magnificent.......big and splendid. Our room on the 6th floor with two huge windows on sea side was quiet, well-appointed in a minimalist way, and perfect for a feeling of peace and relaxation. Breakfast downstairs...fantastic! great choices of food and beverage. would certainly stay again! This web-user gave a score of 5 / 5 to Vacances Bleues on october 2017, but declined to leave a comment. 1 nuit à Menton au mois d'octobre 2017. Tout près du centre. Accueil rapide et efficace. Chambre double privilège très spacieuse et confortable. Très bien insonorisée, magnifique balcon vue sur mer. Petit déjeuner copieux dans un cadre exceptionnel. Jardin exotique de toute beauté. Inoubliable. Very disappointed in the response of the bar staff to a request to borrow 2 glasses to take to our room so that we could drink some champagne that friends had given us for our wedding anniversary--"we have some champagne here that you can drink" -- end result was no glasses provided. Very poor service! 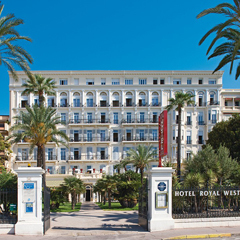 Classic seaside hotel facing the Mediterranean with balconies and sea views. High quality place, spacious and comfortable. Walkable from the train station. Pleasant walk into historic center.